It's time to celebrate the turning of the calendar! 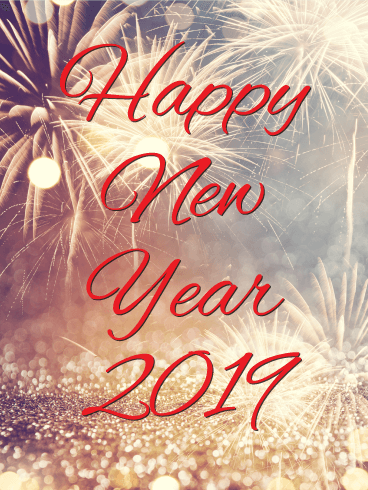 Say "Happy New Year!" 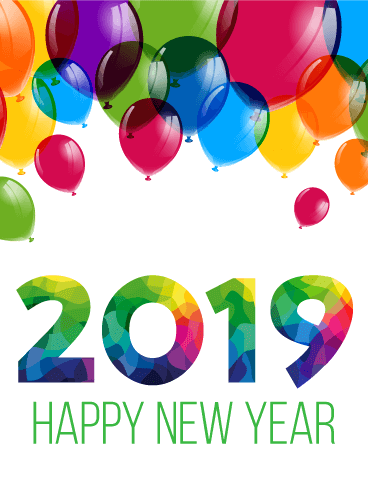 with this colorful rainbow Happy New Year card! This card is filled with geometric diamonds of every different color - yellows, blues, browns, oranges, purples, pinks, grays, and greens. 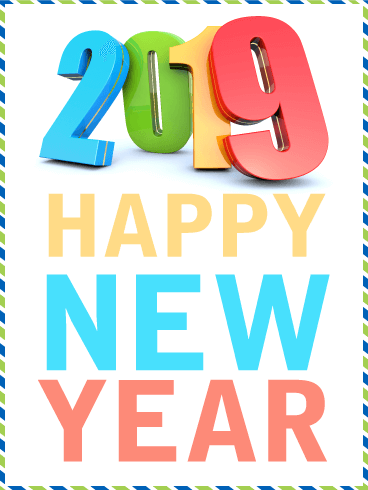 The large, artsy "2019" at the top of the card welcomes the start of the New Year! The start of a new year is a time to celebrate with loud excitement and even louder colors! 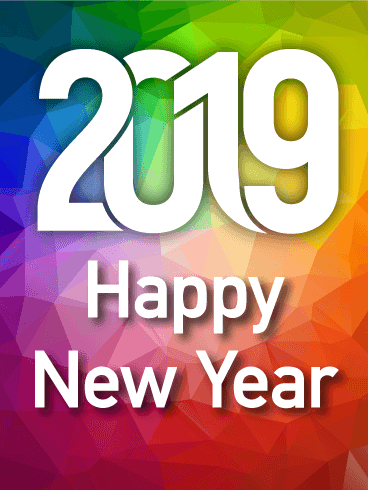 This vivid color Happy New Year card has a bright white background that features a colorful "2019 Happy New Year" message. 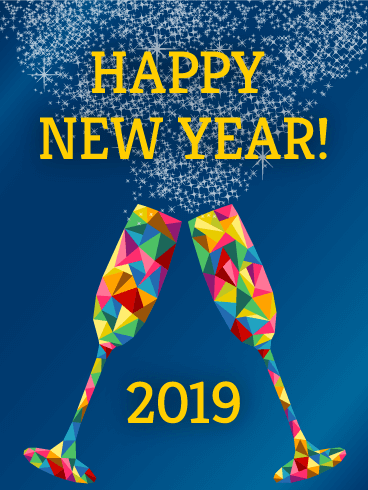 "Happy New Year" is written in blue, red, and yellow, "2019" is mix of colors. Send it to add color to your holiday celebrations today! There's no such thing as too much glitter, especially on New Year's Eve! 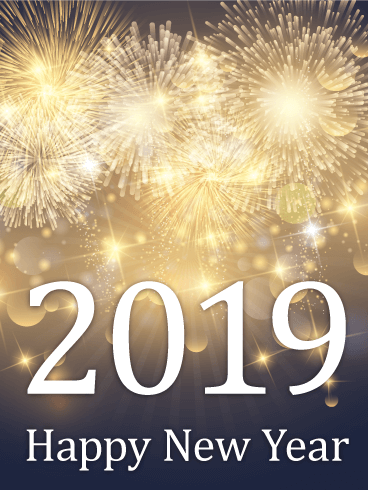 Want to help someone close to you ring in the New Year? 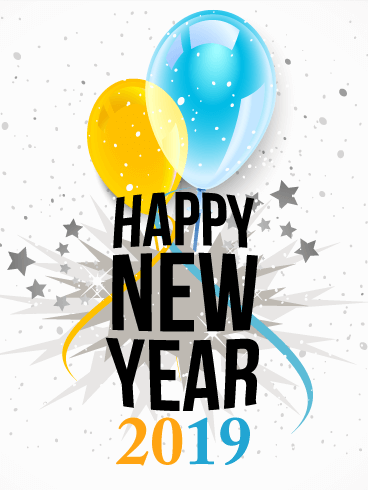 Send them this New Year card that's sure to bring a smile to their face! The gold colors make this a stand-out card, full of life and excitement. Do you prefer to spend your New Year's Eve at a fun-filled holiday bash with your friends? 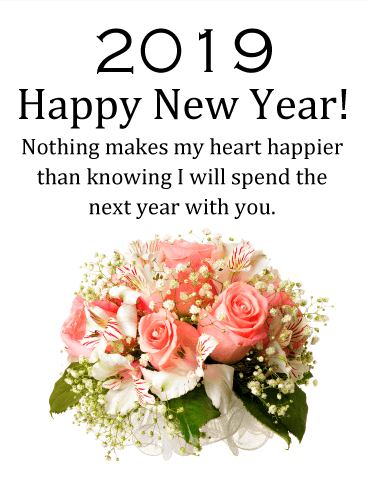 Then you'll love this Happy New Year card! 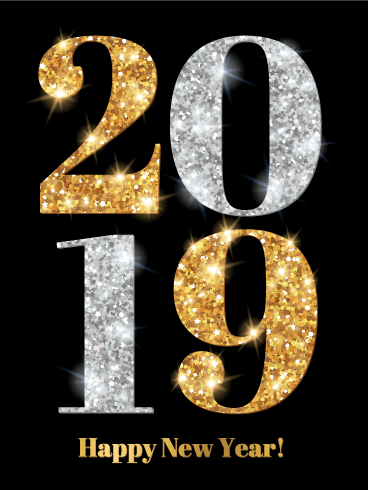 This card's black background features a large "2019" made of shiny, glitter-filled gold and silver numbers. 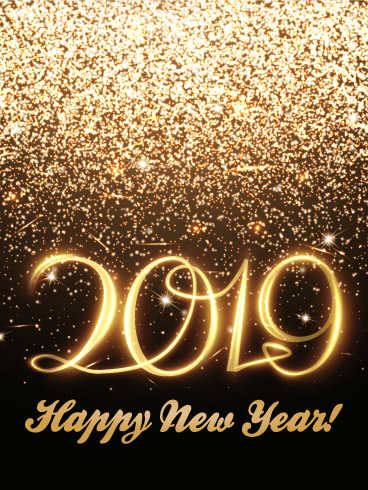 Underneath, gold letters send a "Happy New Year" message to everyone who receives this fun, celebratory New Year card! Make your friends' New Year explode with excitement! Colorful explosions and the bright lights of fireworks will make everyone ooo and ahhh, filling the new year with positive anticipation! Rev up the excitement this year even more with this glitter bomb New Year card. 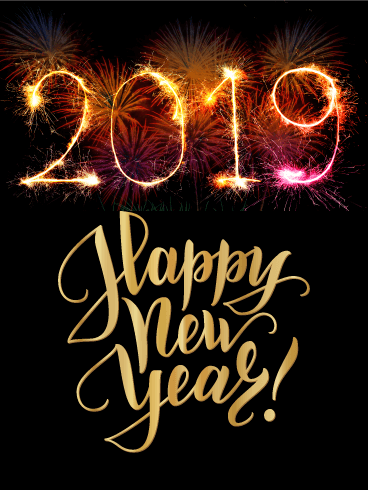 2019 will be the best year of their life - it's only right to start it with the best New Year card you can send! Lift their spirits to the sky! This cluster of colorful balloons is filled with a thousand wishes for a "Happy New Year!" Each one is completely stuffed with love, joy, confidence, and luck - all destined for your friend to help them through 2019. With these balloons and the knowledge of your support, your friends will have a wonderful new year. As the ball in NYC prepares to drop, send your friends these ever rising balloons to start a year of freedom! Jostling to get to the sender first, this bunch of rainbow balloons is eager to share the wishes and hopes tied to their strings. Each one will strengthen your friend, setting them up for a fantastic year. And all because of this New Year card! It's time to get the party started! 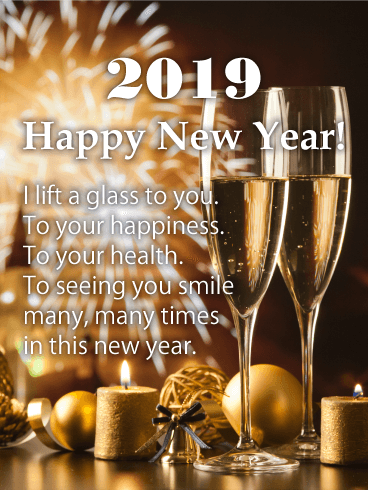 This fun Happy New Year card is a party waiting to happen. The metallic balloons in the air, confetti falling from the ceiling, and streamers waving from the excitement of party goers sets up the perfect festive atmosphere. 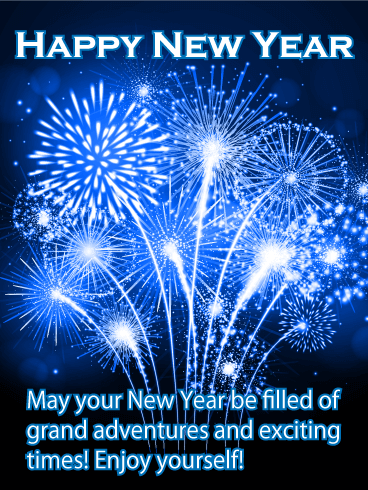 Full of fun and good times, this New Year card will bring a smile to your friends' faces! 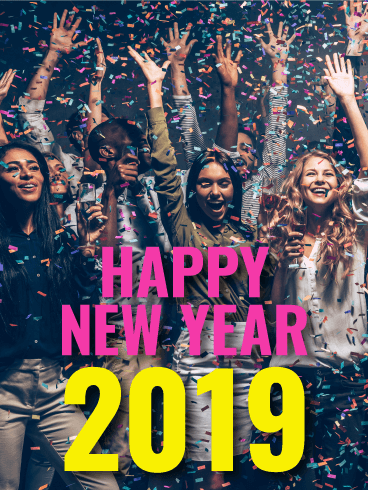 Things are definitely looking UP, thanks to this colorful and fun Happy New Year's card! 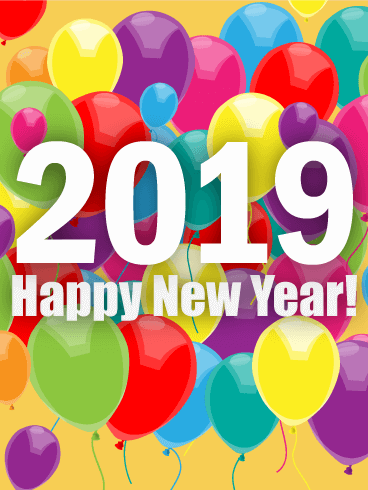 It's a great reminder that even though the last year might have been difficult in spots, this new year brings with it a world of positivity and possibility. What a great way to remind that special someone that hope is just around the corner! Here's thing. We have all experienced both the good and the bad in our lives. 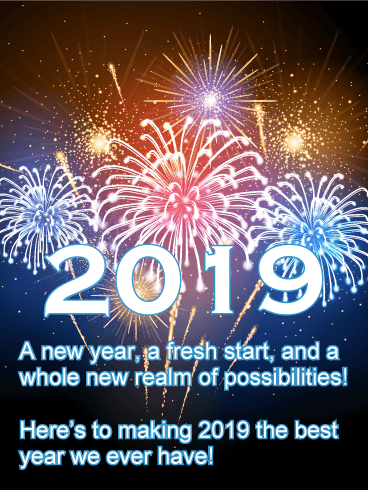 But the new year is always a good time to not only reflect on the past... but let go of it... and look toward tomorrow. 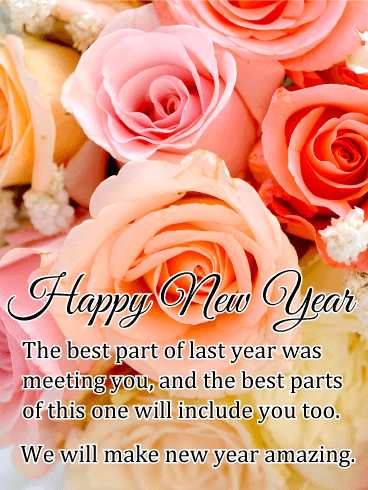 And this New Year's card will help you send the perfect reminder of that! 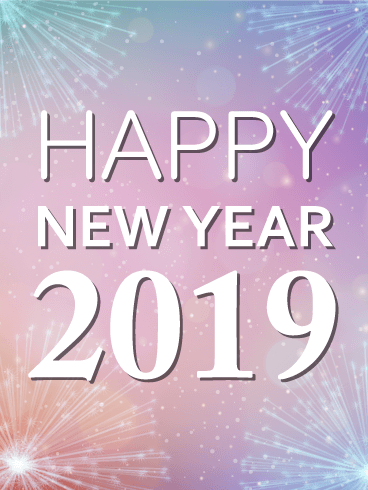 It's time for a bright, beautiful new year! 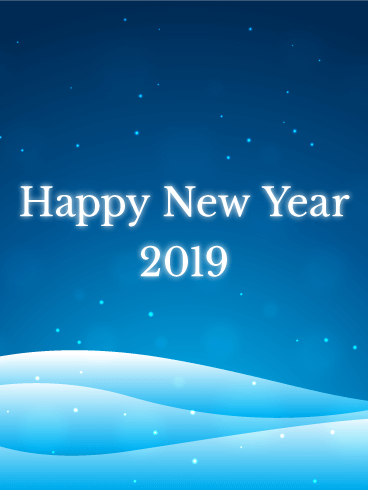 A new year full of promise and hope and happiness! 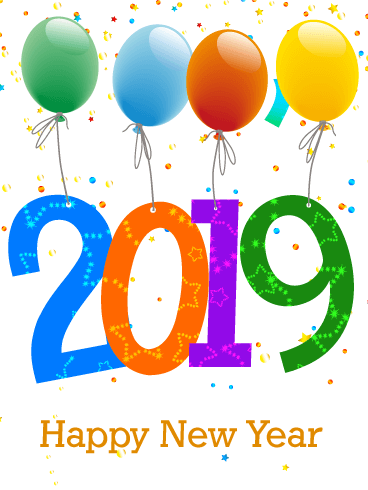 A year full of positive changes and new adventures! Oh... and definitely fireworks! 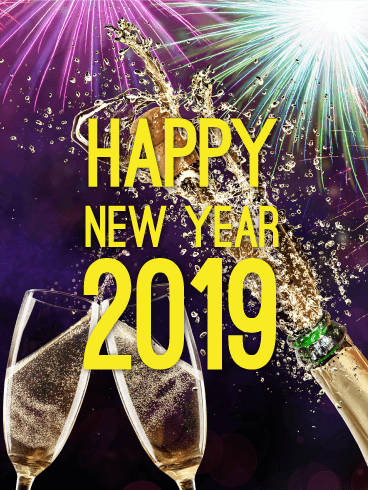 So send your heart-felt wishes across the miles, or just down the street, with this festive firework-festooned New Year's card. 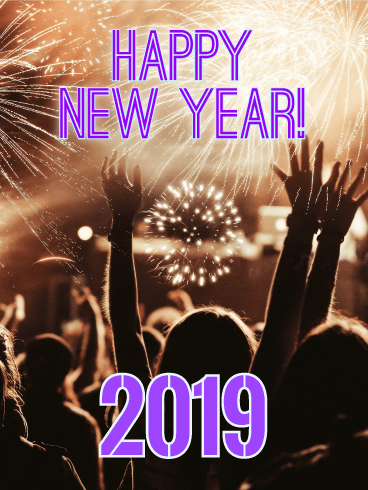 If you want a card that embodies the beautiful, exciting chaos of a New Year's celebration, you have found the right one! 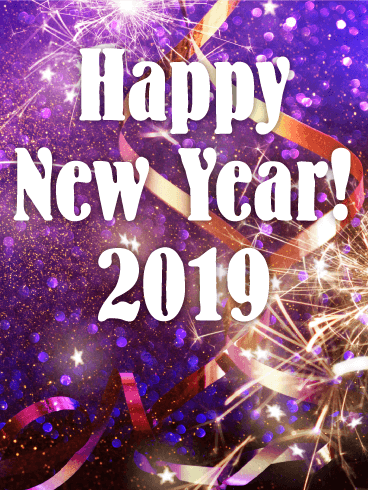 This card's background is lit with bright purple and blue neon lights as sparklers, ribbons, confetti, fireworks, and glitter fill the air. 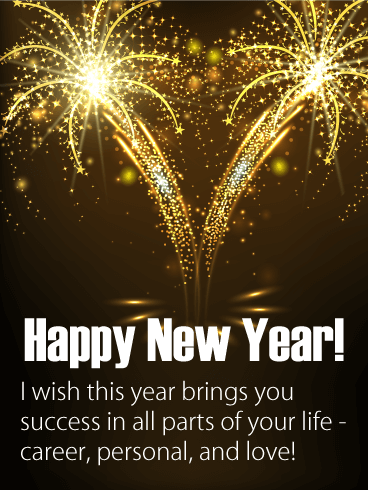 Send this New Year card to your friends, coworkers, and family to say "Happy New Year! 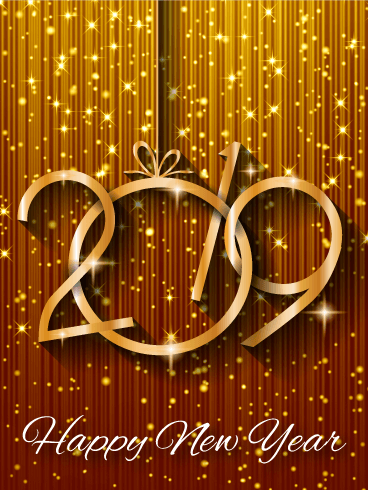 2019" this holiday season! 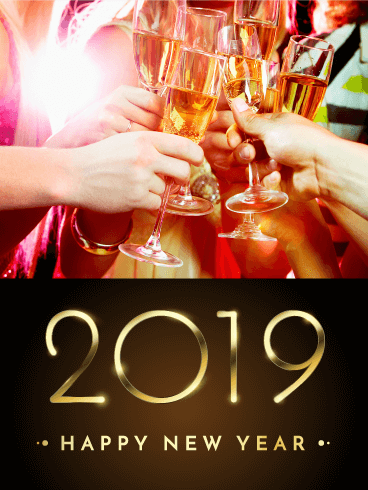 Will you be attending a wild, fun-filled party to ring in the New Year? 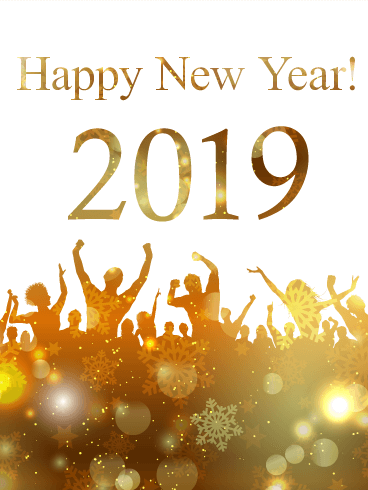 This Golden New Year Party card features a crowd of New Year's celebrators and a "Happy New Year! 2019" message. The bottom of the card is dark gold with snowflakes, spots of light, and bright sparkles on a white background. Send this holiday card to the fun-loving, party-goers in your life! Do you know someone who loves red roses? 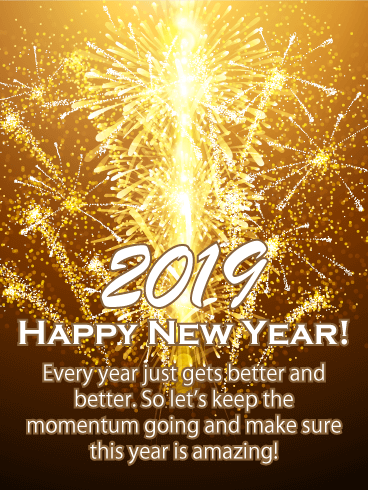 Then you have found the best Happy New Year card to send this holiday season! This card has a faded brick wall background with a chic stone and lace vase filled with red roses. A curl of red ribbon sits beside the vase. 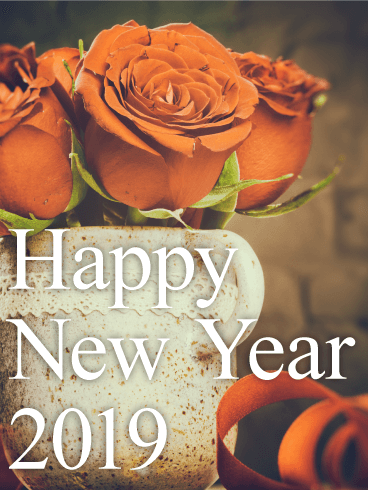 Say "Happy New Year 2019" with this beautiful, elegant New Year card! 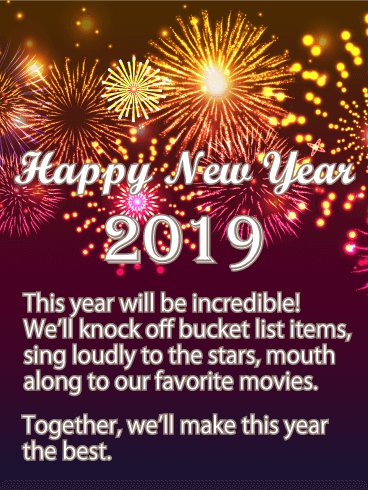 Will you celebrate the start of a new year with a loud and bright round of fireworks? 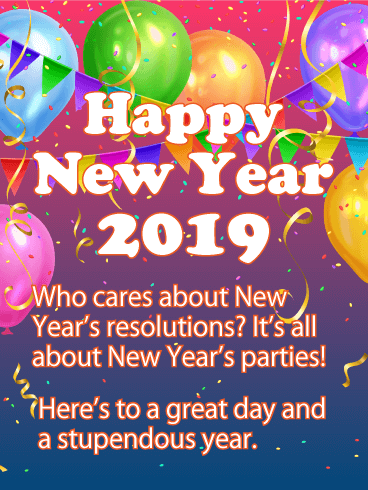 Whether you will or not, use this Happy New Year card to bring the fireworks to your friends, family, and coworkers! The black background is brightened by sparkling blue fireworks, sending out sparks and lines of celebratory light. 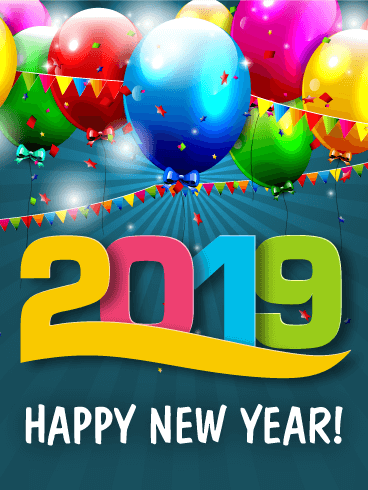 Send this New Year card to say "Happy New Year 2019" today! 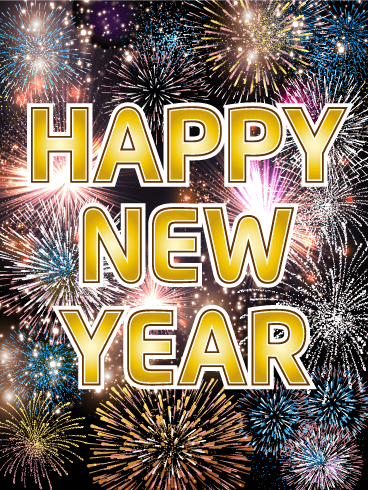 Have you ever attended a fireworks show to celebrate the start of a new year? 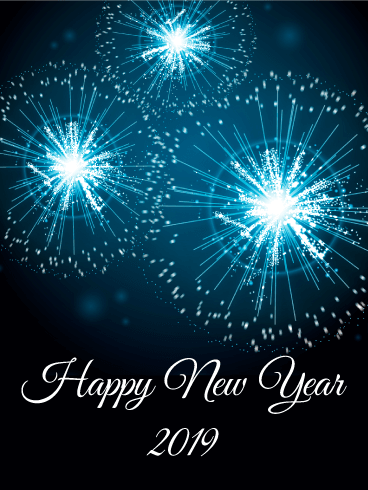 If so, you'll love the design of this Shiny New Year Fireworks card! A dark night's sky is filled with the sparks, lights, and shapes of vibrant golden fireworks and glowing spots of light. 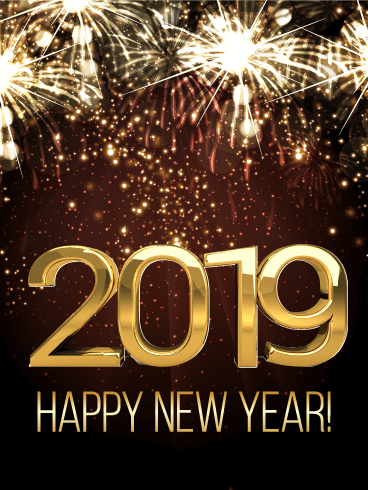 At the bottom of the card, "Happy New Year 2019" rings in the brand New Year! 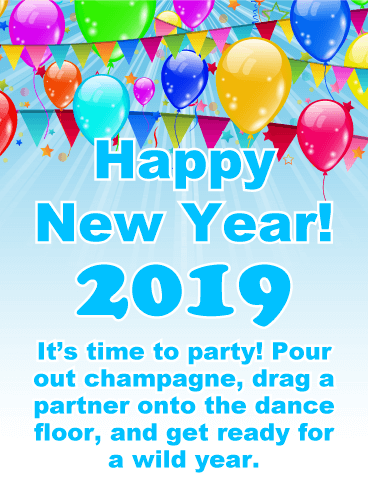 Have a truly groovy New Year celebration this year! 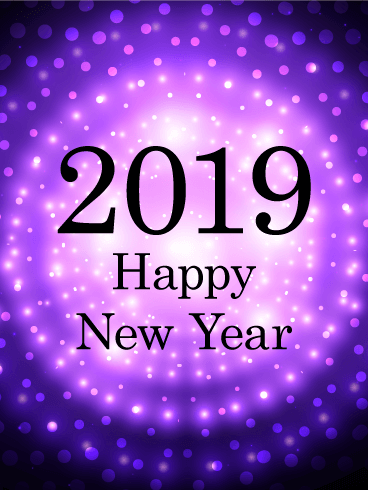 This Happy New Year card features a black background with bright white and purple lights. These lights form a series of rings that fill the New Year card, along with large white spots of light in the center. 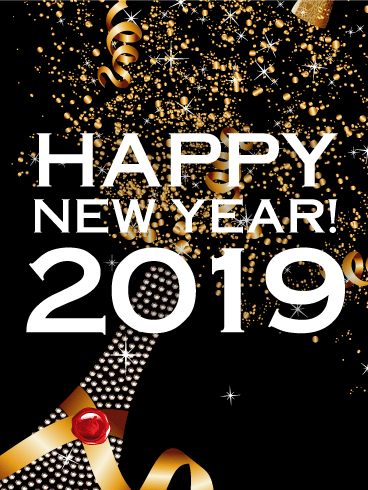 Black text forms a "2019 Happy New Year" message in the center. Send it out today! Is there a pink-loving person in your life? 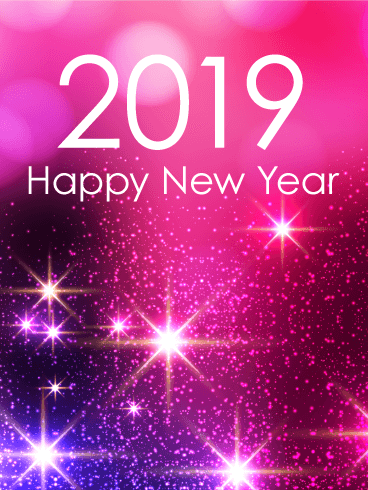 Send them this star-filled pink, blue, and purple card to celebrate the New Year this holiday season! If the night sky was filled with the Northern Lights for everyone in the world, it would look like this card! 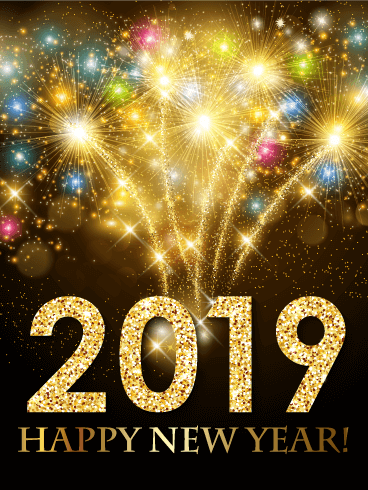 Use these bright stars and colors to say "2019 Happy New Year" to everyone you know and love this holiday season!